The MKG – Museum für Kunst und Gewerbe Hamburg – is currently presenting an exclusive exhibition on tattoos. From the traditional Thai Sak Yant, the anti-Semite camp numbers, the gang face tattoo or the fashionable ones, Tattoo explores the practice through nooks and crannies. Performed with bones, wood or simply needles, the techniques stayed the same alongside its way: injecting ink in the second layer of the skin in order to leave a permanent body trace. Black and white or in color, figurative or representative, tattoos’ deepness and meaning are the central focus of the exhibition. Sometimes asserted as a century long ritual, sometimes simply as a trend to follow, tattoos might be the most spread ink expression of the 21st century. All nationalities, ages, body parts are here exhibited giving an overall vision of the tattoo development. By doing so, the MKG evokes different aspect of the movement linking the artistic scene to the ritual, cultural, anthropological and criminal ones. The prison tattoos are a good example of this last cited field. The Austrian photographer Klaus Pichter dedicated a book to this practice that works like a storytelling, permanently inserted on the owner’s skin. 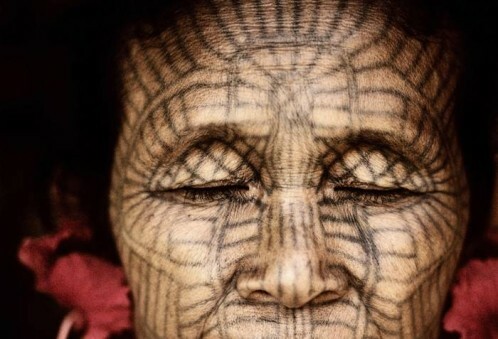 So does the ritual face tattoo of the chin women in Burman. They represent the transition from childhood to adulthood and deliver an instant and inevitable message. Messages are thus to decode all along the show, a show that keeps going in the street of any city.